In April 2018, Butterfly Table Tennis has announced new coming “Butterfly Tenergy 05 Hard Version” in the list of authorized racket covering (LARC by ITTF). Because Tenergy 05 is one of the best backhand rubber on the market right now. So why Butterfly introduces this NEW Tenergy 05 Harder version? What are the advantages of this version versus the normal Tenergy 05 version? Here is the review. Is Tenergy 05 Hard sponge too firm? Why firmer sponge Tenergy 05? Who should use Tenergy 05 Hard? Both of these 3 types (Ten05 Hard, Ten 05 and Ten05 FX) have the same topsheet. Here is the performance rating of Tenergy 05 Hard (provided by Butterfly Catalogue 2019). These ratings are based on the Butterfly R&D Team. By doing several tests, they have provided this rubber chart. 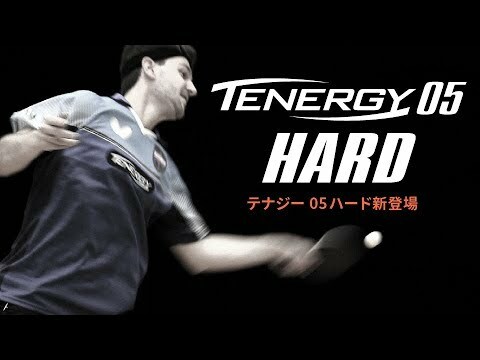 Dan of TableTennisDaily has made a nice unboxing and review of the Tenergy 05 Hard. Here is the performance test of the Butterfly Tenerg 05 (Normal version). Compared to Tenergy 05, Tenergy 05 FX offers the more “all-round” ability. The easy of blocking and short game has been improved. Here is the comparison chart of these 3 types of Tenergy 05. So if your playing style relies on the service, and spin variation, you should choose the Tenergy 05 Normal version. But if you win the points more with power and speed (counter-attack style), you should choose Tenergy 05 Hard. So Butterfly wants to introduce the new Tenery 05 rubber with the harder sponge! And the topsheet is the same! But why? Sponge and pimple structure of the Tenergy 05 Hard. A pimple has 1.7mm size. The SpinArt sponge has 48 hardness degree, while the normal version of Tenergy 05 has 36 hardness degree. So Tenergoy 05 Hard with 43 hardness is something between SpinArt and Tenergy 05. So for me, 43 hardness scale is the right scale for the new poly ball. It’s not too hard! As I’ve explained before, that before this official version of Tenergy 05 Hard, many professional players have used the Hard Version of Tenergy 05! The pro version is only available for the sponsored players, which is not available on the market. This version is much harder than the commercial version, confirmed by Timo Boll. For example, Marcos Freitas has posted his “professional version” of Tenergy 05. Or Tomokazu Harimoto also has his custom Tenergy 05 version. Miu Hirano also used the Tenergy rubbers (pro version). As I have explained previously, with the new Poly ball used in table tennis, this shift is necessary. As many table tennis brands like (Donic, Stiga, Andro) have introduced their “P-series rubbers” for the new poly ball. And now, Butterfly can’t go outside of this trend! They want to join the market with their leadership products Tenergy 05! And here you are, “Tenergy 05 Hard version”! 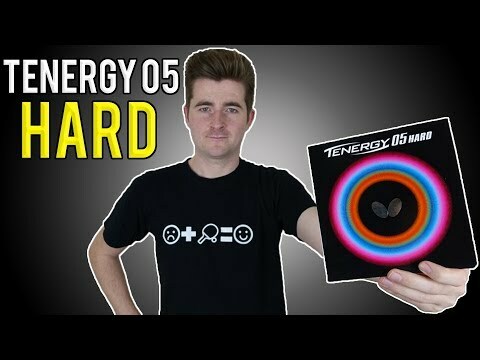 Tenergy 05 Hard will be available for all of us! The new ball which is harder, heavier, thicker has made the “new trends in table tennis”. This trend affects not only the table tennis coach, athlete to change their techniques, but also the table tennis equipment. Notes: Search “new trends pingsunday” to understand more what needs to change in term of your table tennis techniques. This is the smart move of Butterfly to offer the player the harder version of Ten05. Because the Tenergy 05 normal version is not hard enough for this modern game. Nowadays, with the 40+ ball, every player like to hit very hard! They want to hammer every shot at any distance! This is the new style in table tennis! Not only the pro players, but the competitive players want to use the hard version! It’s a confirmed trend! With the harder sponge, the Tenergy 05 Hard is, no doubt, for intermediate players and advanced players. The player who has the high swing speed can opt to this hard version. However, harder sponge means heavier, and harder to control at the short distance! If you find that it’s too difficult for you to handle this, you can try the normal Tenergy 05 version or even the Tenergy 05 FX. Choose the hardness scale that fit your style and your level! This rubber is made of a very delicate topsheet. During several hours of using, it is easily vulnerable to the broken rubber edge, loss of grippy topsheet surface. To protect the rubber, after use, I recommend you to guard the rubber in a dry situation. And always using the film for protection. The sticky film can help to protect the topsheet surface of the butterfly rubbers (check price). It’s not expensive but is necessary. Like your blade, the rubber doesn’t like the humidity. Butterfly also recommend players to glue the rubber correctly. They explained, “to maintains the incredible ‘Spring Sponge’ feel, please use Free Chack II when you glue perfectly Tenergy rubbers to a blade.”. You should also combine the Tenergy 05 Hard rubbers on the right blade. Check here for the top 10 blades that professional players use. I already sent you the wrap footnotes up. Do hope you can fix it to better content. I’ve replied to you with my email. Have you received it? Yes, I got your files, and I have proposed some advice and sent it back to you. What tenergy rubber suits my playing style (counter-driver) like mima ito. And can you suggest blades for me too. Hope to hear from you coach. Mima Ito used short-pips on her backhand. Do you want to use Ten05 for bh or fh? since it is harder,should i use a flexible blade too to get the kick effect? yes, Harimoto has also confirmed that he prefers a flexible blade which can increase spin a bit. So I think yes, you can try a flexible blade with Tenergy 05 hard. Just tried 05 hard ,not for me !less spin hard to control and you need a very soft blade.So not a carbon or ZLC! Question would you recommend Tenergy hard (43) for black forehand and Tenergy Med (36) red for backhand. In another post you mention that the difference should only be +2. I am a beginner/intermediate player looking to improve quickly. Will I notice such a big difference between 43 and 36 to make it feel strange? Also I am considering a flexible all-wood bat such as the Timo Ball allrounder. Thanks for your thoughts here…. Hello. You are right. In general, you can use both Ternergy Normal for both Forehand and Backhand. Tenergy Hard is used to counter attack with the new ball. So if you style relies on counter attack, use Ten Hard. If you want to loop, topspin on FH, use Ten Normal. Per the a Shore C to Shore A conversion chart (http://mytabletennis.net/forum/sponge-hardness_topic43435.html) it appears that Tenergy05 Hard 43 Shore C is “only” 35 in Shore A. Given that I already am using a chinese rubber on my backhand (Dawei Super Power 2008) 2.0mm & 40deg, going to the Tenergy would be kind of like a step backward for me?